The Yardman Self Propelled V559Q lawn mower has a unique 21 inch stainless steel deck designed to last a lifetime. As with any other lawn mower, operators should keep the deck clean of debris and grass cuttings on both the underside as well as on top to preserve the finish and avoid corrosion. The Honda engine is a 160 cc OHV over head cam engine with a certified low emission label. It comes with a 21 inch stainless steel deck, which will mulch , work with a rear bag grass catcher or side discharge of the grass. Each wheel can be individually adjusted to one of nine positions. The rear wheels are larger to provide more stability as well as maneuverability especially with the additional weight of the 61 liter grass bag on the back. 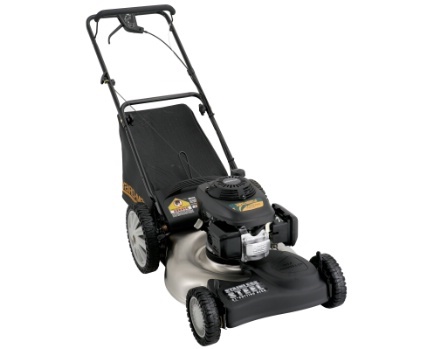 This is a front wheel drive self propelled lawn mower with a variable speed transmission. A nice feature about the front wheel drive is that when working around landscaping etc, all you need to do is tip up the front wheels to disengage contact with the ground and slow the forward motion of the lawn mower. In addition to being self propelled with a variable speed transmission, the Yardman Self Propelled V559Q lawn mower comes with a mulch blade as standard along with the rear bag grass catcher. Operators can also take advantage of the side discharge as well if you prefer not to catch the grass clippings. There is an easy access air filter for cleaning and changing on a regular basis. Follow the guidelines outlined in the manual. The Yardman Self Propelled V559Q lawn mower assembles in a few minutes and also comes with a bottle of oil to be added to the engine prior for starting the engine for the first time. 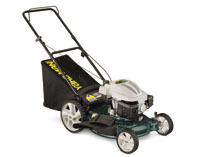 Starting the Yardman Self Propelled V559Q lawn mower is simple. All you need to do is set the choke and pull the starter chord. There is no priming required on this lawn mower engine. This is one of the few stainless steel decks. Designed to last a lifetime, the deck if kept clean of debris will certainly out last many other lawn mowers. Clean and sleek looking, the Yardman Self Propelled V559Q lawn mower will meet the needs of most landscapers and gardeners. 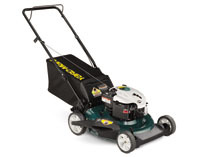 Delivery: This Yardman Self Propelled V559Q lawn mower can be purchased at home hardware stores. Most stores can arrange for delivery, however customers can save on the delivery cost by placing the lawn mower in the trunk of their car or van to take it home from the store. The Yardman Self Propelled V559Q lawn mower is like many other lawn mowers in that it has a great safety record and if operators follow the safety guidelines outlined in the manual and follow common sense rules, they will avoid any accident with this lawn mower. The first step prior to operating the Yardman Self Propelled V559Q lawn mower for the first time is to read the manual and understand completely all of the operating procedures as well as the safety guidelines. Be sure to place the proper amount of oil in the engine before starting for the first time. Prior to starting the engine each time, always check the oil level and top if required. Fill the fuel tank as well and avoid filling the fuel tank when the engine is hot to avoid any possibility of fire. If you do spill some fuel, wait until the fuel has evaporated prior to starting the engine. Never fill the fuel tank with the engine running. When using the side discharge, avoid allowing any person to stand in the path of the discharge. Occasionally sharp objects can be picked up and discharged at a high rate of speed which can hurt someone standing in the path of one of these projectiles. The same applies to cars and buildings as well. 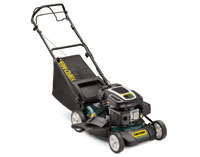 Maintenance is pretty easy with the Yardman Self Propelled V559Q lawn mower. Follow all of the recommended guidelines in the manual. Check the air filter and either clean it or replace it if it is dirty and filled with debris. Change the engine oil as recommended and at least once per year depending on how often you use the Yardman Self Propelled V559Q lawn mower. If you are a heavy user of the lawn mower you might need to change the oil once per month or even more often. Keep the underside of the deck clean and free of grass clippings. Store your Yardman Self Propelled V559Q lawn mower inside also to protect it from the elements.